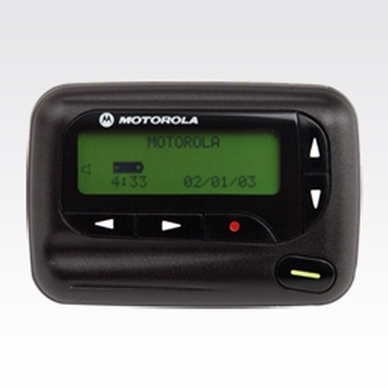 The AdvisorII pager is no longer manufactured, however accessories and replacement parts may be available. Please contact your Motorola representative for additional information. The ADVISOR II pager provides alphanumeric messaging in a feature-rich pager that is ideal for demanding business environments. ADVISOR II displays up to four lines of text with up to eighty characters per line. The zoom feature allows users to enlarge two lines of text while the large electro-luminescent display delivers optimum readability. The Personal and Mail Drop Notebooks offer flexibility in storing messages. 52 message slots enable the storage of multiple pages. 4 individual cap codes allowing the user to receive individual or group pages. Up to 30,000 maximum characters. Optimax EL Electra Light makes readability easy. Allows the user to view the first line of each message for easy reference. Provides the user with another convenient alert. Allows the user to set a one-time or daily alarm for up to 5 personal messages. Includes Vibrating Alert, Standard Alert, Chirping Alert, 7 different Pleasing Alerts, or No Alert (silent) offering the user a wide variety of notification types. Allows the user to erase messages individually or all at once. Allows the user to view the current battery level. Available in VHF or 900 MHz FLEX; VHF wideband and narrowband, UHF wideband or narrowband and 900 MHz POCSAG models.